The following picture shows an example of Azure Information Protection in action on a user's computer. The administrator has configured a label with rules that detect sensitive data and in our example, this is credit card information. When a user saves a Word document that contains a credit card number, she sees a custom tooltip that recommends the label that the administrator has configured. This label classifies the document and protects it. After your content is classified (and optionally protected), you can then track and control how it is used. You can analyze data flows to gain insight into your business, detect risky behaviors and take corrective measures, track access to documents, prevent data leakage or misuse, and so on. You use Azure Information Protection labels to apply classification to documents and emails. When you do this, the classification is identifiable regardless of where the data is stored or with whom it’s shared. The labels can include visual markings such as a header, footer, or watermark. Metadata is added to files and email headers in clear text. The clear text ensures that other services, such as data loss prevention solutions, can identify the classification and take appropriate action. For example, the following email message has been classified as "General". The label has added a footer of "Sensitivity: General" to the email message. This footer is a visual indicator for all recipients that it's intended for general business data that should not be sent outside the organization. The label is embedded in the email headers so that email services can inspect this value and could create an audit entry or prevent it from being sent outside the organization. The protection technology uses Azure Rights Management (often abbreviated to Azure RMS). This technology is integrated with other Microsoft cloud services and applications, such as Office 365 and Azure Active Directory. It can also be used with your own line-of-business applications and information protection solutions from software vendors, whether these applications and solutions are on-premises, or in the cloud. This protection technology uses encryption, identity, and authorization policies. Similarly to the labels that are applied, protection that is applied by using Rights Management stays with the documents and emails, independently of the location—inside or outside your organization, networks, file servers, and applications. This information protection solution keeps you in control of your data, even when it is shared with other people. For example, you can configure a report document or sales forecast spreadsheet so that it can be accessed only by people in your organization, and control whether that document can be edited, or restricted to read-only, or prevent it from being printed. You can configure emails similarly, and also prevent them from being forwarded or prevent the use of the Reply All option. These protection settings can be part of your label configuration, so that users both classify and protect documents and emails simply by applying a label. However, the same protection settings can also be used by applications and services that support protection, but not labeling. For these applications and services, the protection settings become available as Rights Management templates. As soon as the Azure Rights Management service is activated, two default templates are available for you that restrict data access to users within your organization. You can use these templates to immediately help prevent data leaking from your organization. You can also supplement these default templates by configuring your own protection settings that apply more restrictive controls. 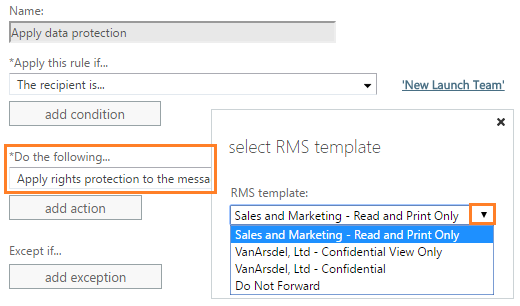 When you create a label for Azure Information Protection that includes protection settings, under the covers, this action creates a corresponding Rights Management template. You can then additionally use that template with applications and services that support Azure Rights Management. For more information about Azure Rights Management protection, see What is Azure Rights Management? This Information Protection bar makes it easy for end users to select labels for the correct classification. If required, labels can also be applied automatically to remove the guesswork for users, or to comply with your organization's policies. 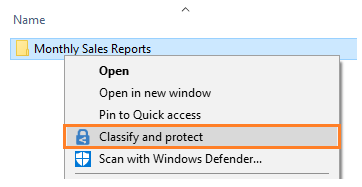 When users select the Classify and protect menu option from File Explorer, they can then select a label similarly to how they use the Information Protection bar in their Office desktop apps. They can also set their own custom permissions, if required. Power users (and administrators) might find using PowerShell commands more efficient for managing and setting classification and protection for multiple files. The PowerShell commands to do these actions are automatically included with the client, although you can also install the PowerShell module separately. When you use Azure Information Protection with Exchange Online, you get an additional benefit: The ability to send protected emails to any user, with the assurance that they can read it on any device. For example, users need to send sensitive information to personal email addresses that use a Gmail, Hotmail, or a Microsoft account. Or, to users who don't have an account in Office 365 or Azure AD. These emails should be encrypted at rest and in transit, and be read only by the original recipients. 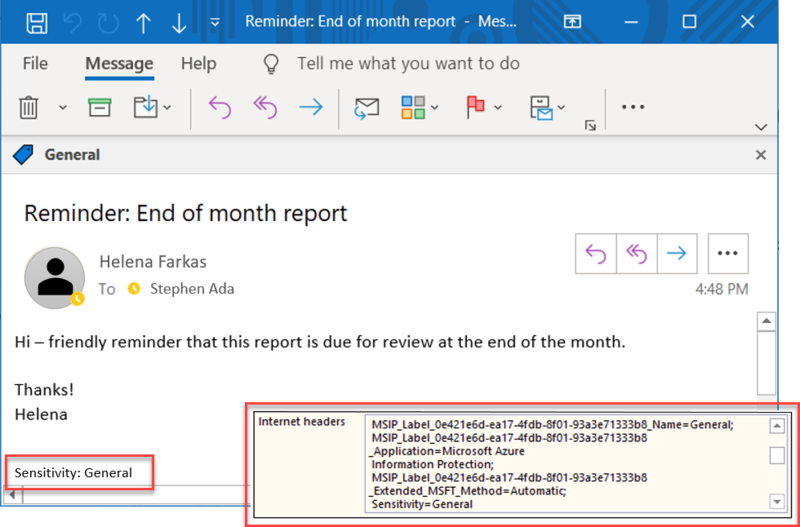 This scenario requires the new capabilities from Office 365 Message Encryption. 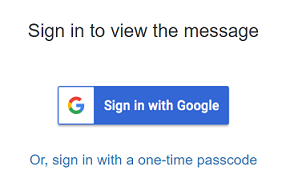 If the recipients cannot open the protected email in their native email client, they can use a one-time passcode to read the sensitive information in a browser. Alternatively, you can automatically provide the protection for users, by using mail flow rules that apply rights protection. When you attach Office documents to these emails, these documents are automatically protected as well. Ideally, documents and emails are labeled when they are first created. But you likely have many existing documents in data stores and want to classify and protect these documents as well. These data stores could be on-premises or in the cloud. For your on-premises data stores, use the Azure Information Protection scanner to discover, classify, and protect documents on local folders, network shares, and SharePoint Server sites and libraries. The scanner runs as a service on Windows Server. You can use the same rules in the policy to detect sensitive information and apply specific labels to documents. Or you can apply a default label to all documents in a data repository without inspecting the file contents. You can also use the scanner in reporting mode only, to help you discover sensitive information that you might not know you had. For more information about deploying and using the scanner, see Deploying the Azure Information Protection scanner to automatically classify and protect files. For your cloud data stores, use Microsoft Cloud App Security to apply your labels to documents in Box, SharePoint Online, and OneDrive for Business. For more information, see Automatically apply Azure Information Protection classification labels and Azure Information Protection integration. For a rollup of announcements that were made at this Ignite, see the blog post Announcing availability of information protection capabilities to help protect your sensitive data. Configure and see Azure Information Protection for yourself, with our quickstarts and tutorials. Or, if you're ready to deploy this service for your organization, head over to the how-to guides.